Do you know who 1 in 200 people are related to? I’m a member of the Genghis can’t clan. Then again if one goes back far enough we’ll all be related to Adam and Eve? And to think that all in the family thought him to be gay, wait till I tell Uncle Festus. Thank goodness he was just a serial womaniser and not a serious one. 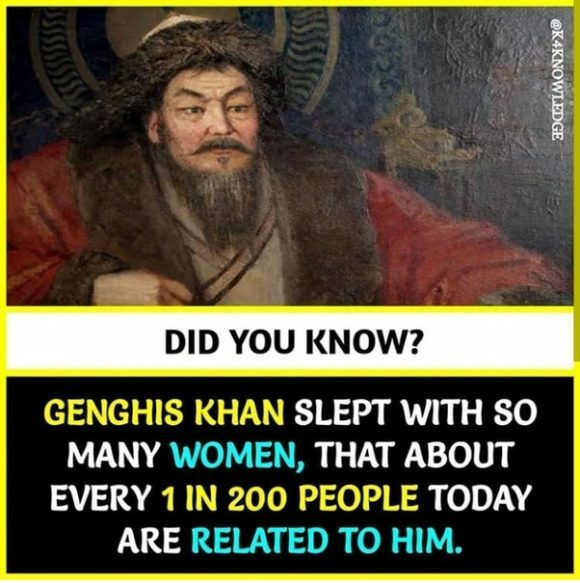 My Ancestry.com dna test did not show a Mongol background, so I guess I cannot claim him as mine!! I have been accused of having a political persuasion to the right of Genghis. Does that make me an extremist? More of a realist tho mind you if you keep going to the right and the World is round instead of flat you are going to wind up left of Genghis and that isn’t good. Previous post: Getup’s power is mythical—if you choose so!